The tenants have given notice or have not had their leases renewed. This building is a classic of an Elementary School of its period.Ruined by insensitive "modernisation" by the Local Authority in the sixties and seventies. The ashlar walls are complete the original fenestration can be rebuilt using in the main existing dressed stone surrounds. If you look carefuly you can see window piercings at the first floor which no longer exists. This building could be easily converted for residential use by stripping out the tatty accretions by building a first floor, and piercing the ornamental first floor windows. Veluxes in the roof for added ventilation and light. The original ventilation system would be ideal but it has been removed and the roof ventilators removed. So much good public architecture has been lost in the Thatcher and Blair years. Why not follow the example of several of our fellow European Union Nations and introduce a law that there should be no demolition of buildings built before 1940, that they should be cherished and updated to give continuing use. This would cut the energy wasted in demolition and in all the new energy intensive materials used in new build. BUT MUCH MORE IMPORTANT IS THAT THESE BUILDINGS AND THEIR ROADSIDE BOUNDARY WALL ARE A NATURAL EXTENSION OF THE MEDIEVAL TOWN WALLS. Demolition would speed the traffic and create extra traffic hazards which will cost vast sums of money to overcome. But of course create opportunties for speculative developers. Quote "Pembroke its castle its walls the existing buildings and the "Burgess Plots"is a town of international significance". The proposed access to the garages could be difficult. Is the "traditional" brick laid in a sand surface capable of carrying builders plant, and builders supply lorries taking into account the need to use the largest available now to carry a hoist capable of lifting materials over the Town Wall. Pembroke is a limestone town, brown brick paviours are completely unnacceptable. The main pedestrian route for schoolchildren and adults is to cross the road at the present bridge to the New Way. Dangerous now but lethal with the road realignment. What provision is being made for a controlled crossing. If it is decided that a crossing cannot be provided until there are necessary accidents, I will hold the PCC responsible for any subsequent pedestrian deaths or injuries. How are the children from Orange Gardens to access the new school. Cross at the foot of St Daniels Hill. Once again completely unnacceptable. How is the present car parking behind the Lonicera piliata hedge to be accessed, or are these spaces to be lost. Which Lonicera piliata is not specified, once again not a indigenous plant but a "fashionable" plant.The access to the car parks will become hazardous once the traffic speed is increased by removing the bend over the bridge . Pembroke is built on limestone , it has a particular flora, why are you introducing alien and innappropriate species. Silver birch is a plant of acid heaths and mountains. Horse Chestnuts fine, depending on the variety, much better would be Ash and Hornbeam which can be selectively coppiced and will regenerate indefinitely, Beech is suitable but drops branches in severe drought..With climate change, evergreen oaks, Turkey Oaks which flourish on limestone and are very drought resistant appear to be the most suitable with Sessile Oak which grows to a limited size and will never require tree surgery until very old age. Evergreen Oaks are grown in other Welsh towns built on limestone and add dignity and presence The trees you have specified are better suited to inner city gardens. Evergreen Oaks are widespread and flourish in private plantings in Pembrokeshire. We must never repeat the obscenities of the recent planting to the West of the New Way, alien species which have to be mulched with tree bark, to exist. When I was a child every west facing limestone wall was planted with a Fig tree,which thrive in poor dry soil and outcompete and cover the destructive ivy invasion of these walls.Why not plant most of the foot of the walls with Fig "Brown Turkey". On the National Trust Stackpole Estate this new build is a good example of a limestone wall built of selected blocks bound by lime mortar. This is vertical crazy paving stuck with Portland Cement to a breeze block or concrete substrate at random courtesy of PCC. This replaces a section of the town wall which fell down after water accumulated when someone blocked the drainage holes. Note there are no drainage holes in these concrete slabs, so we can expect it to fall down again. This building in Broadmoor is one of the remaining examples of the successors to the village blacksmith, when bicycles and motor vehicles appeared. Built of galvanised corrugated iron on a metal frame. There used to be a Penny Farthing hung over the cycle sign. Almost all arched farm buildings of this period have been recycled by itinerant scrap metal merchants. Most farms had latticed tower wind mills to pump water and later to generate electricity there are very few left. So in the twenties and thirties all farms and some isolated dwellings had their own windmills, they whirred and clanked but every one relied on them, no nimbies then, everyone had one, they were once the height of modernity. Sutainable development in a rural environment? Thes two cottages in Carew have been sensitively restored and conserved, the interiors have had all fifties and sixties hardboard artex and plasterboard removed, any repairs have been carried out in traditional materials, modern kitchens bathrooms have beeen housed in the rebuilt outhouses attached to the rear of the row. The roofs are of natural slate the rainwater furniture is very simple cast iron. There are no damp proof courses, the walls have had the cement render hacked off and repointed in lime mortar with local aggregate, then finished in several coats of lime wash with traditional colourants. The cills are slate the windows are hardwood with narrow glazing bars, the lintles raw green Welsh Oak. Contrast this with new building in a similar position, more suitable to the aspirant suburbs of a major city, it has no place in a n isolated settlement in Rural Wales. This marsh has been relatively innaccessable, it is being proposed to drive a boardwalk through it, one of the only wildlife refuges in the South of the County, not for the benefit of naturalists, conservationists, or serious study, but as another dog defeacation Area, what a misuse of public money.We have duty to live and let live with all other living organisms. Not to destroy their last few refuges. This is a new walkway through an isolated wood and marsh on the edge of Pembroke. Used to "exercise" dogs ie defaecation. The owners do not keep their pets on a lead and the one safe area for birds and mammals is being wrecked by frequent disturbance. Access yes but what is the point of walkways through reed beds, walkers can see less than if they observe the reed bed from outside. This is not joined up government, we have recently won an Appeal to reopen a footpath which would give better access and allow a hide to be built at the edge of the open water, this would allow people to enjoy wildlife and not disturb it. A Pembrokeshire lane in winter.The verges have been trimmed and the ditches cleared by PCC, the coppiced ash wood has been thinned and the undercover brashed by the National Trust. This building occupies an early christian site the remains of the settlement are clearly visible in the fields BUT the site is now waterlogged and the buildings decaying rapidly. The lock gate is designed so that power is applied to one side only. If it overcloses or stones obstruct the closure the gate jams. The only solution is to bring in a very large crane to lift the gate. The Eurotat has been built over the only access for the crane. If the crane is used on the other end of the barrage there is insufficient hard surface to support the hydraulic steadies. Solution remove the barrage and allow the Castle Pond to be tidal. The Commons Flood Alleviation scheme allow as the water on the Commons to back up making the water, deep enough to drown a child and the sloping banks encourage children to reach the water, and the new banks are too high and too slippery to allow a child to climb out of the water. The Commons have flooded since the completion of the new near one million pound scheme. Why have these Eurotat been built while this stone built three or four hundred year old building cannot be renovated and occupied . How not to renovate a Pembrokeshire house built of stone and lime mortar, this will all crack and separate after 20years, and if left the sealed walls will eventualy disintegrate. The section of the Town Wall from the New Way East has had all the vegetation removed exposing the stone work. It is very vulnerable. The mortar should be re-pointed with a lime mortar culm, coal and red stone aggregate. 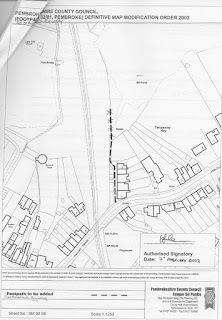 The Order dated 07.02.07 proposed to add a public footpath to the definitive map and statement for the County of Pembroke Littlegates Pembroke to re establish an obstructed footpath which gives pedestrian access to the shore of the Top Pond. This dates to the production of the definitive map in the 1960s when members of PTC, and PCC were determined to resist registration of rights of way which affected their properties. The number of footpaths registered is very low. Paths I have used as child are now blocked or built over and can no longer be used. The structure plan will remove more. The South Shore of Pembroke River from the barrage to Turks Castle is inaccessible, we roamed freely as children I fished there regularly in the fifties. The access to the North Shore and the quarries has been built over by speculative development. There should be more footpaths registered, please post your suggestions. 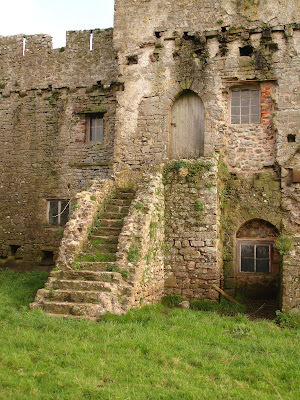 Pembroke is a historic town built to a pattern with large sections of the Town wall in place. Several owners are proposing to drive access through the existing walls as believe it or not the walls are not listed for all their length. PCC is on record that “ they have a predisposition to grant planning applications to build on “brown field sites” within the existing settlement boundaries.